How much junk mail do you really get? For one week, put all of the junk mail that you receive into a bag or box. If you want to make it a game for yourself or your family, before you begin, guess how many pieces you think you will get. At the end of the week, count the pieces of junk mail in the box or bag. You may be surprised by the answer. On average, an American adult receives three pieces of junk mail per day. That will fill your collection box or bag pretty full in just a week! (Remember to put that junk mail into the recycling bin after you finish counting it.) This amounts to more than 100 million trees’ worth of junk mail each year, according to the Center for a New American Dream. Almost half of this mail is never even opened. That’s a lot of paper and energy wasted for something no one wants. You can say goodbye to much of this junk mail by registering with the Direct Marketing Association (DMA). The DMA is a group of businesses and organizations that send people advertising mail. With DMAchoice, adults can have their names removed from unwanted mailing lists. Find all of the details here. 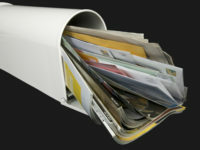 Even when you sign up with DMAchoice, some junk mail may still show up at your house. Make sure you recycle this mail and help conserve our Earth’s resources!